The Voice has been nominated for Outstanding Reality Program at the 23rd Annual GLAAD Media Awards. 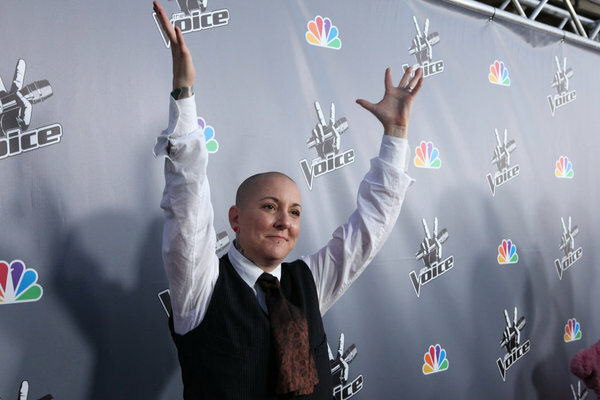 Team Christina’s Beverly McClellan also scored a nom for Outstanding Music Artist, where her album Fear Nothing will go up against the likes of Lady Gaga’s Born This Way. You can see a full list of nominees here. Congratulations to Beverly and everyone involved with the show on the recognition! Team Cee Lo’s Tje Austin has also announced a handful of new tour dates, so don’t miss checking him out if you’re in Texas over the next two months. You can find those dates on the Calendar. Here’s the breaking news: NBC is taking the Big Red Chairs on tour! Yep, starting this Saturday in Los Angeles (where things will be graced by new correspondent Christina Milian), select cities across the country will get to see this blog’s namesakes up close and personal and sit in them. (And having already done so I can say they are fabulous!) There will also be giveaways. The six dates include stops in Los Angeles, New York, Chicago and Minneapolis. For the specific dates and locations, check the Calendar now! ← Adam at the Globes, Tje’s New Single, & Alison’s New Gig!